He was 25 years old. He combed his hair like James Dean. She was 15. She took music lessons and could twirl a baton. For a while they lived together in a tree house. In 1959, she watched while he killed a lot of people. Martin Sheen and Sissy Spacek play young lovers on a shooting spree across 1950s South Dakota in Terrence Malick's turbulent, gut-grabbing masterwork. Kit Carruthers, a young garbage collector and his girlfriend Holly Sargis from Fort Dupree, South Dakota, are on the run after killing Holly's father who disagreed with their relationship. On their way towards the Badlands of Montana they leave a trail of dispassionate and seemingly random murders. A very intriguing narrative without judgements, and lacking the usually sensational approach of this genre. Very good acting and directing, and beautiful photography. The script was based upon the true story of the Charles Starkweather and Caril-Ann Fugate murders in 1958. For Terrence Malick’s debut film, we go to 1973’s Badlands. Set in South Dakota, aimless Kit Carruthers (Martin Sheen) loses his job as a garbage man on the same day he meets teenage Holly Sargis (Sissy Spacek). Kit immediately falls for Holly, but they encounter snags because her father (Warren Oates) doesn’t want her to date Kit due to both his low-rent status and his more advanced age. Kit and Holly sneak around behind her dad’s back, but eventually he catches on and punishes her. Kit tries to persuade Holly’s dad to let them date, but this doesn’t go the way he wants so Kit shoots him. This sends them on a wild path. Kit fakes their deaths to keep authorities off their trail, and he and Holly hit the road together. They set up camp in the woods but have to flee after they kill bounty hunters who come after them. This sets them on the lam again, and we follow their trail as more and more deaths add up along the way. Loosely based on the killing spree committed by Charles Starkweather and Caril Ann Fugate in the late 1950s, Badlands definitely provides a more linear, narrative-based effort than the average Malick flick. Malick’s next movie – 1978’s Days of Heaven - became the template for the rest of his career, as it provided lovely images but lacked a concise plot. Malick’s fans seem to love his loosey-goosey sense of storytelling, but others can be driven a bit bonkers by the heavy emphasis on visuals to the exclusion of all else. This doesn’t mean Badlands lacks any of Malick’s standard sensibility, though, as it still shows a definite pictorial emphasis. However, it does try harder that his subsequent films to tell an actual narrative. That makes it much easier for the “average Joe” to invest in Badlands. Malick brings a good sense of depth to the movie and avoids simplistic elements. While the film easily could’ve been cartoony – ala Oliver Stone’s Natural Born Killers - it maintains a reasonably serious take on matters. No, I wouldn’t view it as documentary-style realism, but it brings a feeling of substance that it could’ve lacked. In an interesting move, Badlands tends to paint all of its characters as nuts, not just Kit, the most obvious psychopath. For instance, Holly just throws away some sick fish, and her father shoots a dog to punish her. We get a sense of disposable life as background, which allows the movie to lack the judgments we’d expect. No, Malick doesn’t excuse the murderous actions, but he offers context – and keeps this from the silly surrealism in which Stone would wallow two decades later. Malick also manages to create a narrative that moves at a pretty good pace. While not exactly action-packed, the film does go along at a reasonable clip and allows us to invest in the characters and events. Badlands delivers an unusual and involving story. Badlands appears in an aspect ratio of 1.85:1 on this Blu-ray Disc. The image suffered from the limitations of its source but represented the original material well. Sharpness was generally fine. Some wider shots could be a bit on the soft side, but those elements didn’t create a notable concern. The majority of the movie demonstrated good – though not great – definition. I witnessed no issues with jaggies or moiré effects, and print flaws were absent. Grain could be heavy, but that was a natural outgrowth of the original photography, so I accepted it. At no point did the film deliver a dynamic palette, as it tended toward a sober feel. Nonetheless, occasional instances of brighter tones occasionally emerged, and these looked quite good. Blacks were reasonably dark and tight, while shadows showed pretty good clarity; a few shots looked a bit thick, but most seemed fine. Given the qualities of the source photography, this was never going to be an attractive presentation, but the Blu-ray made it look about as good as possible. The movie’s LPCM monaural soundtrack was fine given the film’s age and origins. Dialogue occasionally showed some thinness but the lines remained intelligible and reasonably natural. Effects often lacked depth but came across as acceptably realistic and lacked distortion. The music worked about the same; the score was appropriately rendered but not with great punch. All of this was more than adequate in the end. How did the Blu-ray compare to original DVD from 1999? Audio differed, as the DVD included a 5.1 remix. I wasn’t wild about it so I was fine with the Blu-ray’s original mono track. The sound was a little clearer and tighter here. Visuals showed more obvious improvements. The picture seemed much better defined and cleaner, with a more “film-like” feel. The DVD was pretty ugly, so this gave us a substantial step up in quality. Though the DVD came with no extras, Criterion release adds a few. A 1993 episode of American Justice called “Charles Starkweather” runs 20 minutes, 46 seconds as it offers notes a summary of the events fictionalized in Badlands. We get a good take on the real-life story, especially via the use of intriguing archival materials. It’s not a thorough examination, but it gives us a solid look at the subject. Two interviews follow. We hear from Editor Billy Weber (21:52) and Producer Edward Pressman (12:34). Weber covers various story/editing issue, while Pressman chats about his life and career as well details of the Badlands production. Both programs offer useful thoughts, though I prefer Weber’s piece, as he offers nice insights into Malick’s methods. In addition to the film’s trailer, we get a 20-page Booklet. It provides an essay from filmmaker Michael Almereyda and some credits/photos. It’s not one of Criterion’s more substantial booklets, but it adds some good material. Significantly more narrative-based than subsequent Terrence Malick films, Badlands becomes arguably his most satisfying effort. It creates an unusual and rich portrait of young killers that never resorts to simple concepts. The Blu-ray boasts good picture and audio along with a few useful bonus materials. 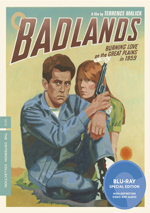 Arguably Malick’s best movie, Badlands comes to Blu-ray in fine fashion.